Last year, four experiences made me think about the life expectancy of fruit trees and inspired me to write this series. The first article, ‘The old man’s trees’, referred to fruit trees that were grubbed up by their owner, an ageing gardener who downsized his orchard to keep it manageable for him. Today’s article is also about an uprooting of fruit trees, planned as part of the conservation of a fruit collection. I am going to narrate this second experience as it unfolded. I came back to the British National Fruit Collection1 on 26 June 2018, after a first visit in July 2017. 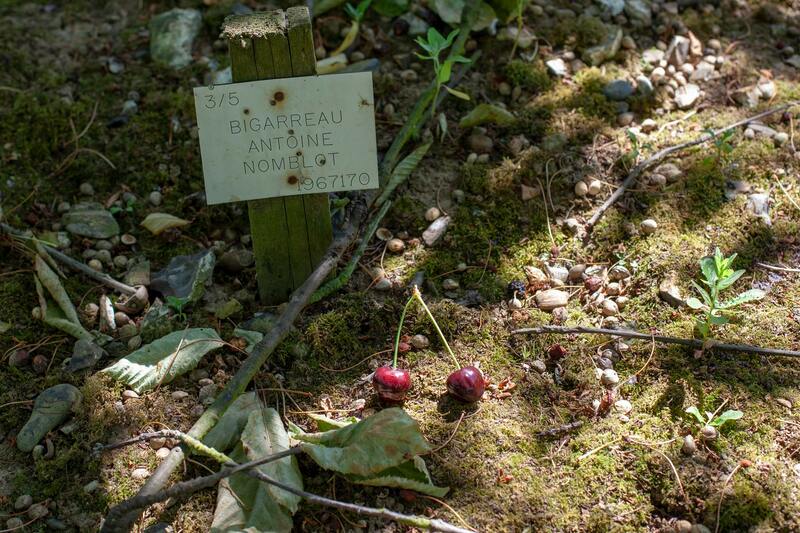 After I collected information in the archives to support conservation work in France2, I went to see the cherries, remembering the great time I had in the cherry collection the previous year3. I hadn’t made plans for my afternoon visit to the cherry orchard. 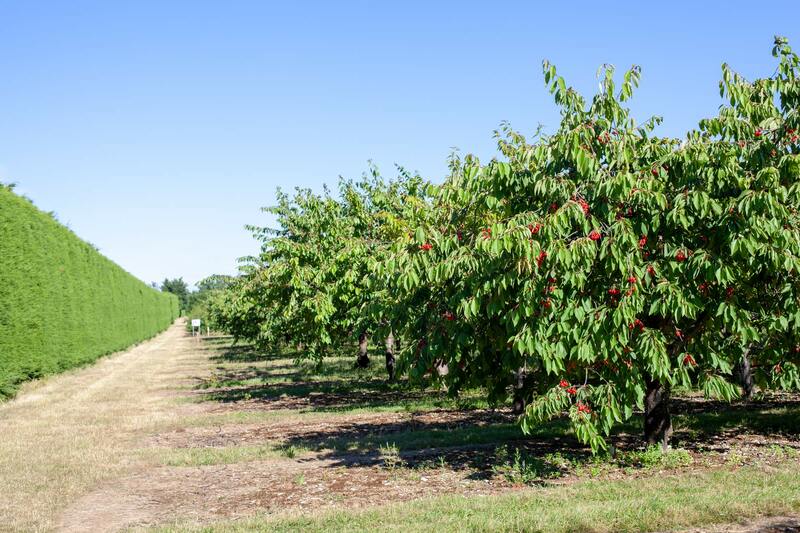 I just knew I wanted to discover more about the cherries on site and maybe see and taste a larger sample of the three hundred varieties available. 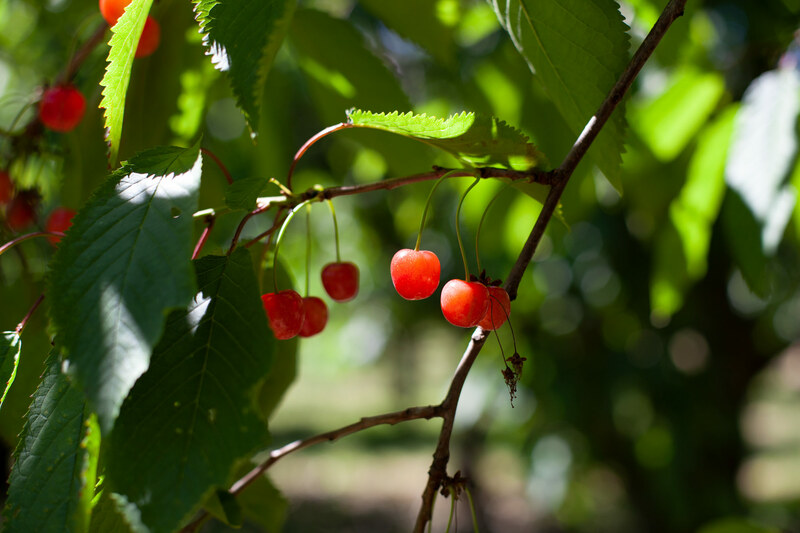 The conditions were even better this year, the weather was great and we were right in the middle of the cherry season. Arriving at the cherry orchard. What a great day to visit this place! Photo 26 June 2018, Brogdale, Kent, United Kingdom. The Horticultural Curator of Brogdale’s collections accompanied me to the orchard. During our conversation, she made me aware of the plan to remove the trees as part of the cherry collection’s renewal. New trees would soon be ready to take over the ageing ones. This news made the visit quite special. I thought I might never see these beautiful trees again. I was offered to stroll through the cherry collection. 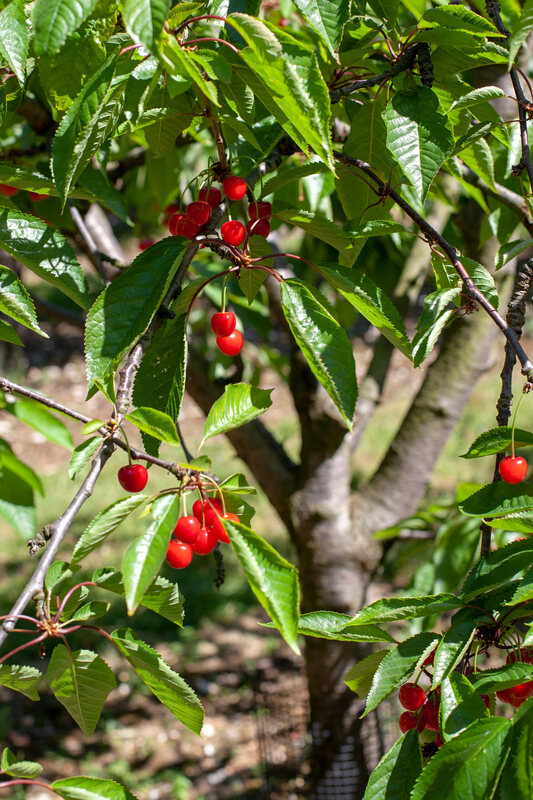 Along with my initial idea, I decided to taste as many cherries as I could and to collect a sample of a few varieties I found of interest. I started from the first row of trees. 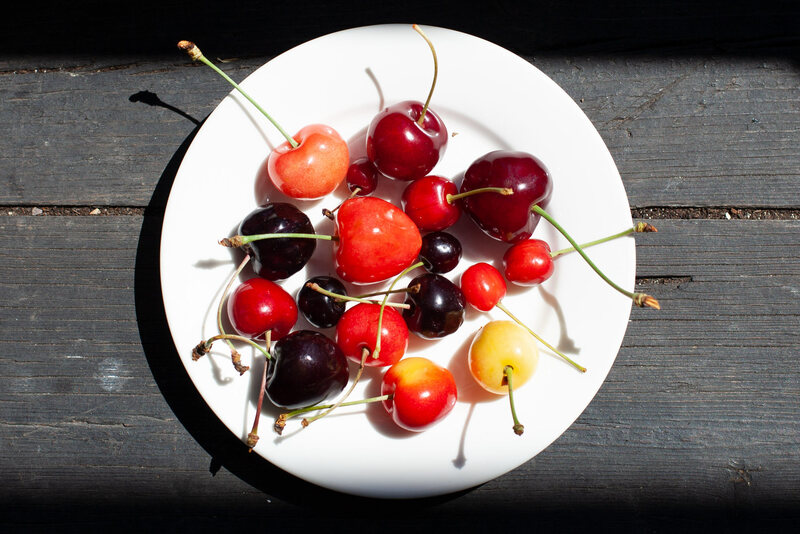 I stopped every time I saw fruit, tasted one cherry per cultivar and put two of those I liked in a sample bag. 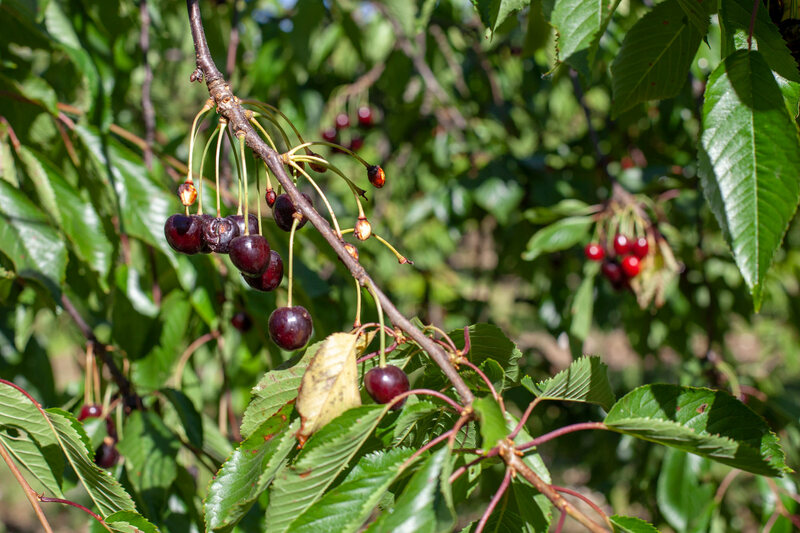 I described their main characteristics on a piece of paper, for instance sweet or sour and soft or crunchy, and took a picture of the cherry sample next to the name of the variety to keep a traceable record of my observations. One of the varieties I particularly liked, sweet with a bit of tartness, very crunchy and tasty. It started well: most trees had perfectly ripe cherries on them. However, the plan proved to be unrealistic. After an hour, I had only done a sixth of the whole collection, and I was already having difficulties to figure out my preferred varieties, getting confused by so much tasting. So I changed my plans and walked more quickly through the rows, stopping when I was seeing something worth a particular observation and a picture. I rushed a bit, I wanted to see and feel as much as I could, to make the best of this short visit to a place due to disappear. The days of the cherry trees were counted. Having this in mind left me with mixed-feelings as I walked through the orchard. 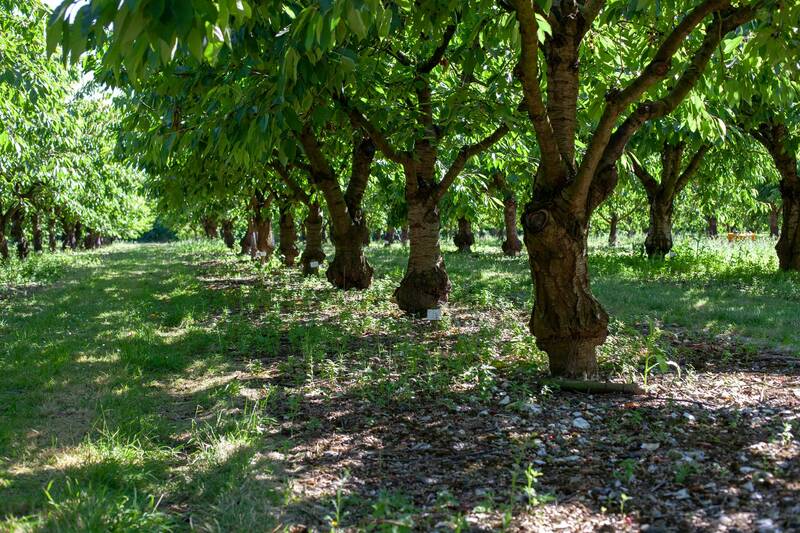 Is the conservation of fruit trees about keeping things as they are? In fact, it could be seen pretty much as the opposite: it is about constantly replacing trees that would otherwise die. On the other hand, I saw these beautiful productive mature trees, and my inner self wanted them to stay and continue to live. Interestingly enough, I had this feeling when I observed the collection from the outside, after I was left alone to carry out my research in the field. Once among the trees, I forgot about it. I was deeply enjoying the warmth in the mid-shade, the almost silent breeze in the leaves, the vegetation and the limestone on the ground, the bang and smell of powder of the bird repellents, the occasional blackbird flying through; and of course the trees, their strong grafted trunks and rings fifteen centimetres above ground, the sunrays through their canopy, the green shelter they provided, their fruit of all colours, sizes, shapes and tastes. I was just there enjoying the moment, conscious of the privilege of being in the middle of man-made nature at its productive peak, in communion with the living forces which, beyond their impermanence, consistently grow and renew themselves. Strolling in the shade under the cherry trees on this hot and sunny day was a great moment. The birds liked this variety very much, and I did too. It was very soft, sweet and juicy, very ripe. I tasted them during the second phase of my walk through the orchard: I didn’t take a note of the cultivar’s name. Unfortunately, during the following days I lost the piece of paper where I recorded my observations. As a result, I was unable to name most of the samples I brought back home. On this plate, I was only able to recognise the large pink-orange cherry in the middle, a Merton Glory, and the yellow German cultivar, the name of which I forgot. Photo 28 June 2018. It may be heart-breaking for a tree lover to realise that some fruit trees are denied the possibility to age. However, replacing trees in conservation orchards before they get weaker is a means to make sure that the collections are well maintained and no variety is lost. This entry was posted in Stories and tagged Brogdale, Cherries, Kent, UK by Les Jardins d'ici. Bookmark the permalink.